Another day of craziness in the capital of crazy in the land of the fat and the home of the dumb. Ok, that was kind of uncalled for but f***, when they've got a place called Heart Attack Grill, and a massive piece of fat jokingly referred to as a burger massing up an insane calorie count of 9982 kcal (I bloody hell hope that includes the fries aswell, but I'm not entirely sure). It is THE fattest burger on the planet, appointed by Guinness Book of World Records... And of course my stop for dinner for tonight. In all honestly, I didn't even dare try the Quadruple Bypass (the mega burger with a full pound of meat). I tried the single bypass (1/4 pound of meat, see what they did there?) and some flatliner fries (fried in lard) and of course a coke from the promised land of sugar and the childhood diabetes it leads to. Simple math says that my burger should equal about a quarter of what the quad indulge in, still an impressive and equally incredulous amount. I have never quite taste anything that fat in my life, the fries where all soft from all the grease in which they had been bathed in, they burger was literally dripping with fat and even the coke tasted sweeter than normally. Despite all that, the burger was actually alright. Not fergburger quality, but better than McD at least. Suffice to say, it's cool to have been there, they had a lot of humor built into the place, but I am NOT going to eat that much crap in quite a while now. Apart from that, I walk through the Luxor, Excalibur, Mandalay Bay, MGM Grand and a couple of other theme hotels/resorts/casinos. Common for all were that they always had tons of live shows going. There were more than a few I would've really liked to see: Cirque do Soleile (?) had like 4 different performances, all stoked with acrobatics and inhuman feats. La Reve (the dream) is a similar concept, albeit in and above water, from all the trailers I've seen of it, it looks utterly breathtaking. There was also plenty of comedian and magician performing regularly on different theaters around the strip. Speaking of strip... Ranking in just after acrobatics, by my count, were the burlesque show, but as I mentioned before, if all you wanted was to see scantly dressed girls, a walk through a casino could satiate that desire for free. 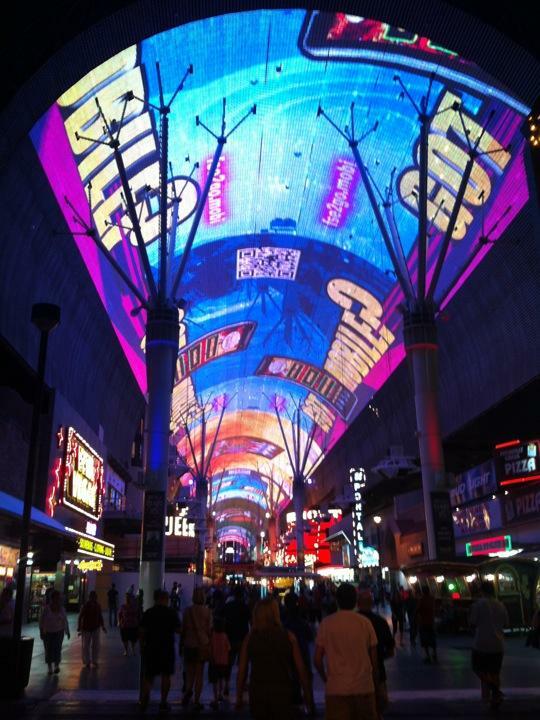 Apart from all the displays in front of the major casinos, probably the most astounding thing to do for free was the Freemont street experience. They've taken an old, run-down walking street and basically put a roof over the entire street, so about half a mile long tunnel where they pretty constantly show films ON the ceiling. The entire roof is just an amazing light show, of course with accompanying spectacular speakers throughout the length of the roof. But light show in this instance doesn't just mean randomly flashing light, they show custom made films there. Then you had the volcano eruption in front of The Mirage, the Bellagio fountains and the sirens of TI on the top of my favorite showings of awesomeness in Vegas. Oh, btw, I got stuck in an argument with a guy carrying a "Jesus is coming back" sign for like an hour or two... Freakishly fun! Sane dude, except for the fact that he was trying to convert people in Sin City... Grilled him about the old testament, the likelihood of Jesus, the errors in the gospels and so on. Managed to get him speechless a fair few times, which by my count is job well done. And that's pretty much it for today. Plus I got my second beer in the states. The first one I got the very first night, and now I actually managed to score one on my last night here. There's got to be some hidden symbolism that you can read into there. Me? Im just glad to have an ice cold beer again, even if it's a f***ing miller lite and tastes light watered down buffalo piss. Next up, early tomorrow, Toronto!